The fabulous beach town of Mar de Plata is a favorite Easter getaway. Thanks to argentalico for the photo. Hola boys and girls, and welcome to Argentina’s Travel Guide’s first edition of The Weekend Buzz. A weekly column dedicated to satisfying your primal urge to get out of the house and do something fun. The concept is simple; to give you the latest news and recommendations on what’s happening both in and out of Buenos Aires each and every weekend. Whether you’re here for a quick stay, or you call this place home, we’ve got you covered. If we don’t, let us know and we’ll cover it. So sit back, relax, and enjoy the Buzz. This week is Semana Santa, or Holy Week, in most of the Christian world. This means that many businesses and services will be closed throughout the country. Beginning on Thursday, and on through Easter Sunday to Monday, many Argentines will be traveling. Think of it as Thanksgiving with a Jesus twist. How does this affect you? Well, for starters, it’s a great time for a day trip or even a short weekend excursion. Also, if you’re staying in town, there are still plenty of things for you to do, you just need to know where to find them. Some of the more popular day trips from Buenos Aires are Colonia, Uruguay, Tigre, San Isidro, San Antonio de Areco, and a visit to el campo, or the countryside. If you’re really adventurous, and don’t care much about sleep, take a 4-hour bus ride to Rosario, one of Argentina’s up and coming big cities. If all of these seem like a bit of a time crunch, you can always pack an overnight bag and go a little further off the beaten path. Beaches: Though the end of summer is fast approaching, the weather is still warm, and the beach is not out of the question. 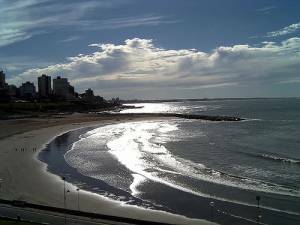 Head down to Pinamar or Mar del Plata for a splash of sun and sand while you still can. Sure, the throngs of tourists have mostly left these beach-side vacation towns, but that only means more tranquility, better deals, and shorter lines. Cities:If the beach scene isn’t your cup of tea and you’re looking for a city excurssion, go to Montevideo. The Uruguayan capital is safe, friendly, and very accessible. It’s much smaller than Buenos Aires, so you won’t be overwhelmed. The Buquebus ferry service can get you there in just a few hours from Buenos Aires and it’s relatively cheap. Remember your passport though, you’re going to Uruguay. Also, it’s best to change your money at the boating docks when you arrive. The Uruguayan peso trades at about 1/22 to the US dollar, and around 1/7 for the Argentine peso. Sick of the heat? Head to Comodoro Rivedavia, the largest city in Patagonia. While it’s still summer there, it’s far enough south to pretty much guarantee packing a sweater. Though a bit on the far side, a plane can get you there in just over an hour. Bus rides are around 20 hours, so flying is optimal. Plus, airfare is cheap, and once you get there you’ll find that the city is far less expensive than Buenos Aires. As you may or may not know, soccer (futbol) is top dog among Argentine pastimes. Each weekend there are a bevy of matches to see, and this weekend is no different. In Buenos Aires, check out Velez Sarsfield v. River Plate. Both teams are at the top of their division and will be competing at River Plate Stadium in Nuñez, the safest and largest stadium in the country. The game starts at 6pm, and usually lasts about 2 hours, including half-time. Tickets run anywhere from $20-$80 pesos. If you really want to make a day out of it, stay in Nuñez for some pro basketball action, where Obras Sanitarius takes on Peñarol de Quilmesin the final game of the ’07/’08 regular season. The game starts at 9pm at Obras’ Stadium (Av. Libertador 7395), and tickets cost between $10-$20 pesos. Though many locals are heading out of town to see friends and family, many tourists are not. Therefore, the best places to go to grab a drink or hit the dance-floor are downtown. Some easy suggestions: The Shamrock (Rodriguez Peña and Arenales), The Spot (1261 Ayacucho), Ocho Siete Ocho (878 Thames) , Deep Blue (1204 Ayacucho), and Kilkenny (Reconquista 1000). This page rendered in 0.25 seconds.